Do you post everything to Instagram or Facebook but neglect to post it on your own blog? This video will make you think twice. In the video below, Haley explains when to use each and how they both enable your content to work harder for you and your business. 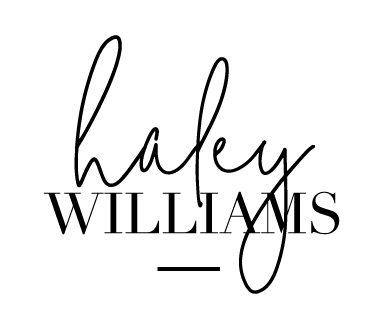 Hi It’s Haley here with H. Williams Creative and I’m coming to you with a message today about blogging versus social media. I actually wanna talk abotu this topic because I’ve had a conversation — several conversations — with with some clients recently. They had some confusion on blogging — the difference between blogging on your website and posting on social media. Blogging is basically creating content on your website that lives and is hosted on your website. Now, a blog doesn’t have to be on your website, but I recommend all my clients post it on their website because then you own the content and it’s pointing people directly back to your website where you’re doing your selling and converting of all your traffic. So a blog lives on a platform that you control and you own. So with social media, you don’t own Facebook, you don’t own the rights to all Facebook’s pages and links and even you don’t own access to those links. Facebook decides how many people will get to see a post that you make on your own Facebook page and they decide how many of your followers will actually see that. You post the content to your page which you think you own – but really Facebook owns it. They can take it away or take it down at any time if they want, as well as decide how many people get to see it. Let’s think about the difference between how we use these two tools. Blogging should really be viewed as the place that you create your content while social media is the place that you share your content. So, what I see a lot of business owners doing is utilizing their social media accounts as though they were owned media in a sense that it was media that they owned and controlled. And then not taking that content and putting it on their own site to let it actually work for them. Because when you only post on Instagram or on Facebook that content does not help your website really at all yes you are creating some inbound links to your site if you’re looking to your site but you’re limiting the access to that link to just your audience and then, just your Facebook or Instagram allows us to see the post. If your Instagram post is about blogging vs. social media, but you’ve only posted on Instagram and not on yoru website, it’s much less likely to be found if it’s posted on instagram only – and only on your page there. Not to mention if you have privacy settings set up and then it won’t be found. To wrap it up, blogging is where your content lives and social is where the conversation lives. That’s the definition there. Use that to decide where to post the content that you’re creating, that you’re spending your precious time to think up and create and put out there for the world. Don’t just post it on Instagram or Facebook. If you don’t know how to post to your blog, reach out to us and ask us, we can do a walk through or a training of how to post to your blog, how to create content on your website. If you don’t have a website that has a blog, let us know, we can help you with that as well. This isn’t a complicated thing at all, but it’s so important in terms of getting found and having your content and your voice actually help people find you and help your ideal, target clients find you online. Hope that helps. to help creative entrepreneurs just like you.